Wonder, intrigue, curiosity and discovery – qualities that are so often missing from our busy lives. That was before Authentic Models. They’re interested in appealing to the mind as well as to the eye. Designed to mirror the unique beauty of antique objects and curiosities, Authentic Models’ pieces come across as both functional and decorative, lovingly recreated from materials that don’t break from tradition. This Art Horse Model is very similar to what would have been used way back then. With its wooden ball-jointed legs, neck and head that could be positioned in various ways, it would have been used as a reference point when a live model of this skittish creature was not available. 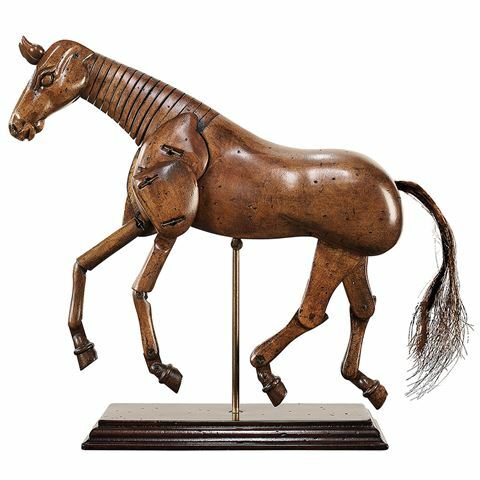 Perfect for modern artists as well, this Art Horse Model is an ode to the artisans of the past. Made from lacquered wood with an aged appearance. Ball-jointed head, neck and legs that can be positioned as a reference point for artists. Minimal assembly required to construct the model's stand. An interesting display piece for the home office or studio. Dimensions: 23cm (l) x 22.5cm (h) x 6cm (w).